King Abdullah of Jordan has told the US Congress that America must throw its weight behind an urgent drive to make peace in the Middle East. Addressing representatives and senators in Washington, the king said the status quo could not be allowed to continue. It "is pulling the region and the world towards greater danger... the cycle of crisis is spinning faster," he warned. The king suggested a solution to the Israeli-Palestinian conflict was more urgent than the conflict in Iraq. While Iraq was a source of concern, "the wellspring of regional division, the source of resentment and frustration... is the denial of justice and peace in Palestine". "Sixty years of Palestinian dispossession, 40 years of occupation... have left a bitter legacy of disappointment and despair," he said. The BBC's James Coomarasamy in Washington says King Abdullah came as an honoured guest, and an important US friend and ally in a volatile region. His speech was couched in flattering terms, our correspondent says, but it was also designed as a wake-up call to Washington, an implicit criticism of its lack of engagement in the Israeli-Palestinian conflict. He said there was now a "rare and historic moment of opportunity". 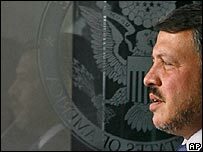 He called for support for a Saudi peace plan drawn up in 2002, which offered collective Arab recognition of Israel in return for a viable Palestinian state. But he said the US must move fast. "Nothing can assert America's moral vision more clearly, nothing can reach the world's youth more directly than your leadership in a peace process that delivers results, not next year, not in five years, but this year," he said. "We need all hands on deck. The international community, especially the US, must be engaged in moving the process forward." King Abdullah was addressing a joint session of Congress for the first time, but in doing so followed in the footsteps of his father, King Hussein, who spoke in 1994 when, following the Oslo Peace Accords, there was optimism that the Arab-Israeli conflict could be resolved. "With Israeli Prime Minister Yitzhak Rabin beside him, he spoke of a new vision for the Middle East. And their courageous work for peace received bipartisan support from your leaders," King Abdullah told US lawmakers. "Thirteen years later, that work is still not completed. And until it is, we are all at risk."